Figure 1. The extent and thickness of the Hutchinson Salt Member of the Permian Wellington Formation. 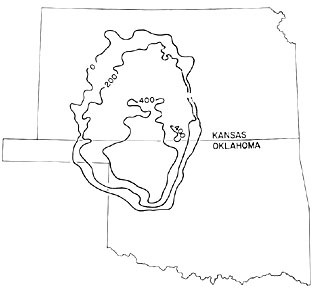 Hutchinson is approximately south central Kansas where the white break in the contour line is located. This image was scanned and modified from Walters, 1978, p. 3. See the Kansas Geologic Survey website www.kgs.ku.edu/Hydro/Hutch/GeneralGeology/index.html.